I know I’ve told you guys before but I am that girl. You know the one. I bust out my yoga pants and boots and proudly stroll through Target clutching my pumpkin spice latte the day the calendar flips to September 1. I just can’t get enough pumpkin. It’s a problem. A disease. The internet calls it basic. I call it just being me. This time of year my blood bleeds pumpkin spice. I’d gobble up pumpkin for breakfast, lunch, and dinner. And really let’s not forget dessert. Because pumpkin dessert=heaven. My husband doesn’t bleed pumpkin the way I do. In about 3 weeks he will be over of ALL the pumpkin and squash that I force on this household. He’ll beg me to make a s’more cookie or just say to heck with it and make one himself and in process come up with some sort of crazy burger. Fortunately Goose seems to have inherited the pumpkin love from me. This kid loves pumpkin flavored stuff too. While I won’t let my toddler drink my pumpkin spice cream or partake in the joy that is the almighty PSL, I have no problem giving her a scoop of homemade pumpkin ice cream or stirring some pumpkin and cinnamon into her oatmeal in the morning. Oatmeal isn’t exactly portable though, and pumpkin ice cream, while I can totally justify it as a healthy choice for myself, gives me a big old dose of parental guilt if I let her have too much at once. So, where does this leave us? 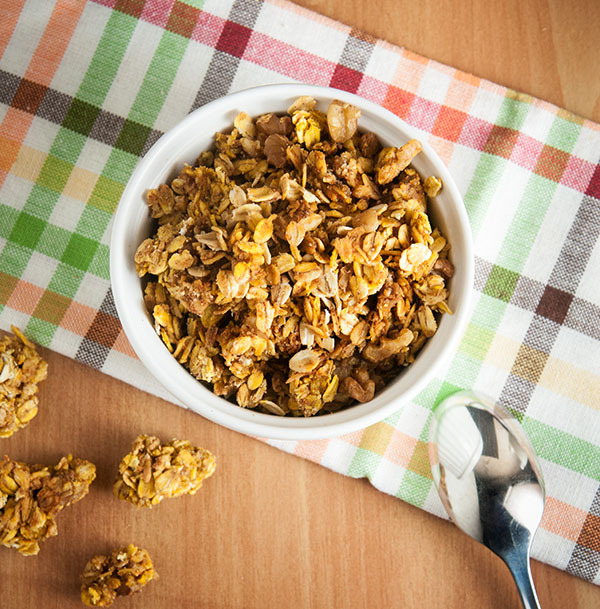 Hello, pumpkin granola. 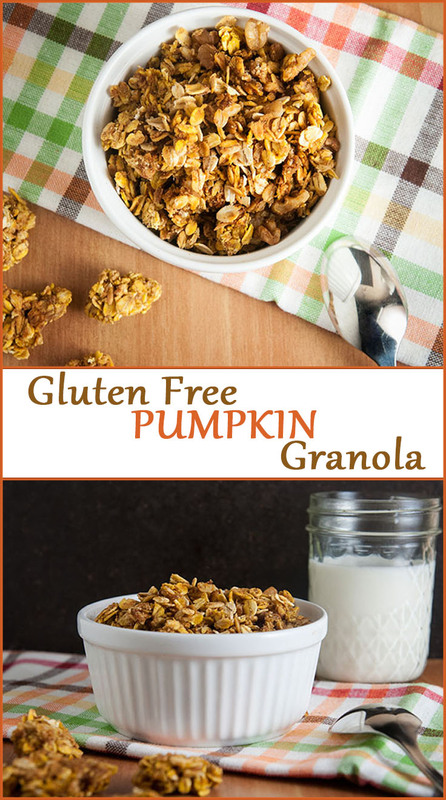 This easy gluten free pumpkin granola tastes like fall, can be eaten just like cereal or carried around dry for a quick, healthy snack. Plus it comes together in no time at all. A 5 minute prep and boom it’s doing it’s thing in the oven, making your house smell of cinnamon and pumpkin. Is there anything better on an autumn day than something cinnamony and pumpkiny baking away in the oven making your house smell glorious and your belly rumble? In a small pot over low heat, melt the coconut oil and whisk in the pumpkin puree and maple syrup. Season with half of the cinnamon. Remove from heat and whisk in the milk. In a large bowl, toss together the oats, nuts, brown sugar, salt, and remaining spices. Pour the wet ingredients over the dry ingredients and toss together until clumps form. Spread over a cookie sheet covered with aluminum foil and sprayed with nonstick spray. 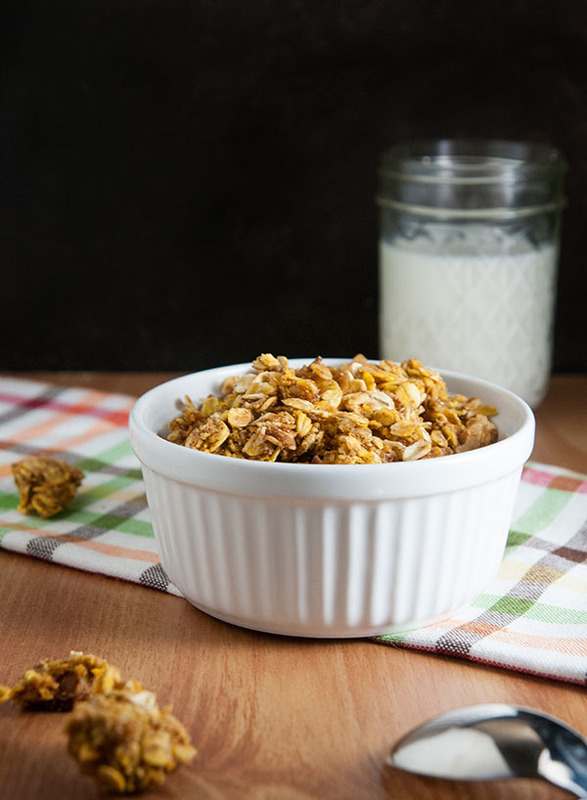 Bake in the oven for 20-24 minutes or until the granola is lightly brown at the edges. * I used gluten free rolled oats. This looks so delicious!! According to the internet, I am basic haha! 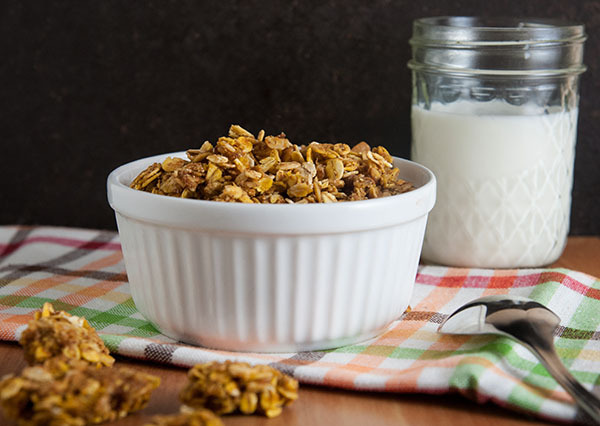 Mmmmm…I see pumpkin granola yogurt parfaits in our future! This sounds heavenly, definitely not basic! 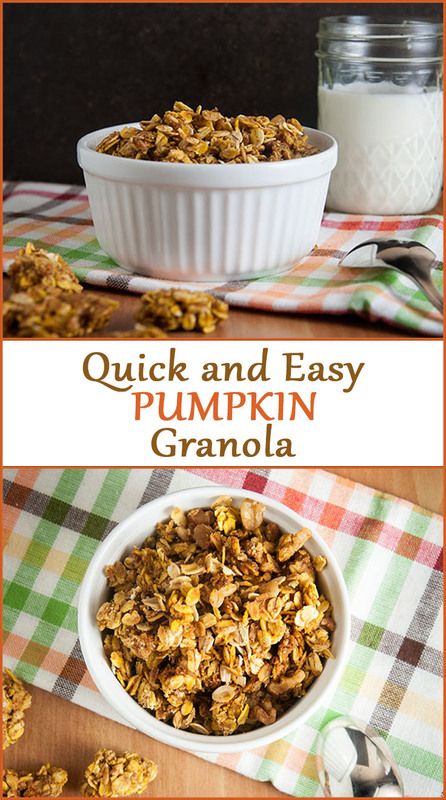 I eat granola for breakfast everyday, and LOVE pumpkin, so definitely trying this! Yes!!!! Pumpkin season is on! This looks so amazing with a tad of greek yogurt! Yummy! Yum! So excited for fall recipes – bring on all the pumpkin things! 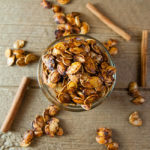 I love anything pumpkin flavored and granola is one of my go-tos for a snack. I can’t wait to put them together and try this! Til the season! 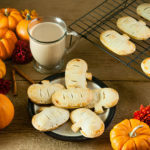 More yummy fall recipe to try and I LOVE t his can be breakfast! This sounds SO good!! And so fitting for fall. Must try! 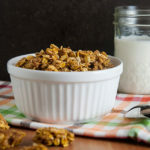 Pumpkin granola sounds delicious, would love to try it! 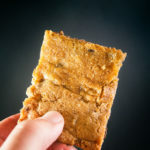 Omg will definitely be trying this recipe out. In a need to make some granola soon. Thanks! This sounds delicious! I’ll have to try this recipe. This looks too good to be true. I need a treat to share with some friends on Tuesday and this totally fits the bill! IT IS SO GOOD! 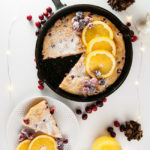 Seriously one of my favorite fall breakfasts! 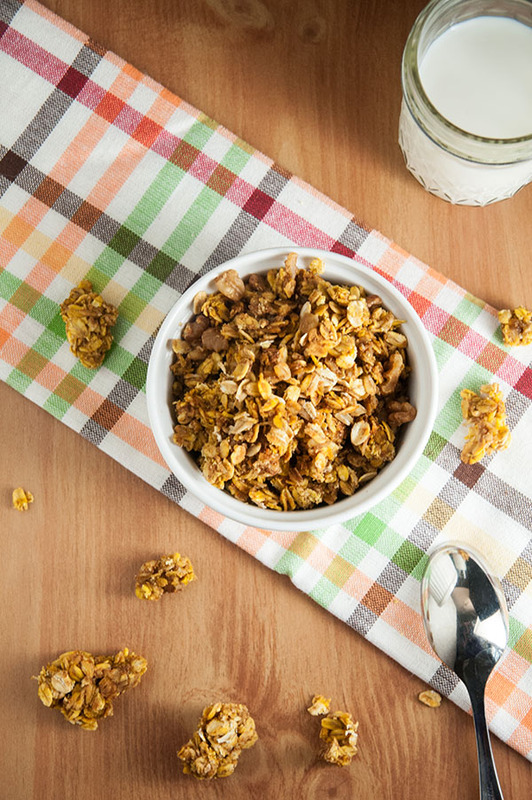 I love granola…Nice one. Well done.